It is said that imitation is the sincerest form of flattery. The M36 has been described as “the nautical equivalent of a Stradivarius” by Yachting World Magazine. Morris Yachts’ quality construction, together with her Sparkman & Stephens design pedigree, guarantees a boat that will turn heads in every harbor. Whether sailing with the family or a singlehanded day out, sailing couldn’t get any easier or more fun. With their self-tacking jibs and control lines led aft to the helmsman, these boats are designed to help any sailor make the most of their precious time on the water. We encourage you to take a moment to visit this unbelievably beautiful modern classic while at the Corinthian Classic Yacht Regatta presented by Officine Panerai. She’ll be fast at the face dock on Friday, Saturday or Sunday. This is a boat that must be seen to understand that American ingenuity and quality is alive in a Morris Yacht. 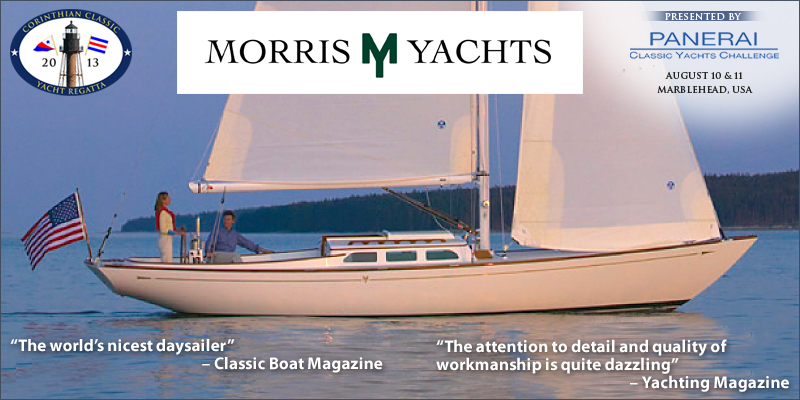 We’re proud to have Morris Yacht’s as a Partner to the 2013 Corinthian Classic Yacht Regatta.